Jennifer Joe is awfully busy with homework and tests and group projects and things like that these days, so last weekend I trundled off into Stockholm by myself to watch a soccer game. Good thing I checked the home team's website just before I left and found out that the game was not being played where I thought it was being played—that pitch had been usurped by the European women's championship rugby tournament. 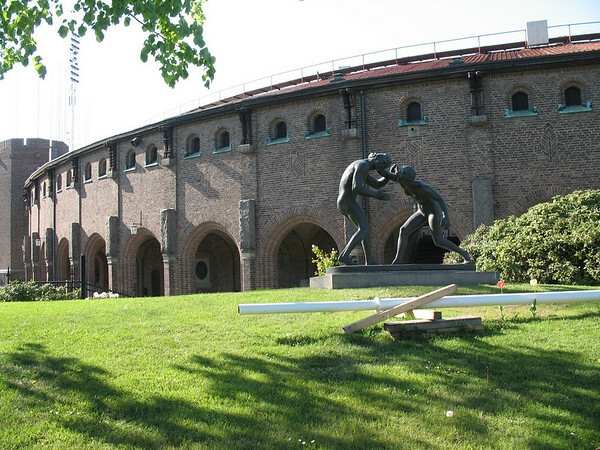 Instead, it was being played in an even cooler place, Stockholms Stadion, which was built for the 1912 Olympic games. Stadion is a red brick pile, in that early-20th century nouveau/deco style that I really like. The northeast stands have a wooden roof, the columns of which have been decorated in simple style to be evocative of a long house. The king has his own covered seating area, complete with potted flowers (he did not deign to be present at the Djurgården-Linköping ladies football match, however). The stadium is sort of strange size, being too big for small sporting events (like women's soccer) and too small for big sporting events (it was really too small even for the 1912 Olympics). It's now often used as an outdoor concert venue. 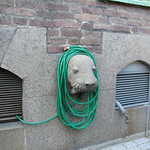 It lots of little decorations and embellishments—one of my favorites was this walrus-head poking out of the wall and now being used as a hose-keeper. One nice thing about following a relatively obscure sport, with low attendance, is that security is rather relaxed. So when I sat myself in the media section (complete with desk and chair with a backrest), nobody said a peep. Perhaps it was not quite as posh as the press boxes at the football stadiums at UM at MSU, but it was a big step up from the bleachers I usually find myself in. It was extra fun because I met a friend there, and we yapped happily about soccer through the whole game, which itself was a good one—here's my write-up if you're interested. 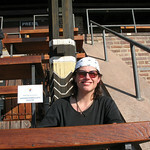 Also, it was warm in the stands, being in the full sun and out of the wind. All in all, a really good day.